Since I started running last July, I’ve found myself eating healthier–this was partly the result of some conscious lifestyle changes (kicking soda and limiting my red-meat intake, for instance), but as I became more active, it started to feel like my body was starting to crave different things. I also learned the importance of post-workout refueling so that I wouldn’t be wiped out for the rest of the day after a long run. 1 Tablespoon Olive Oil* (Vegetable/Canola works too), or enough to coat your saucepan. Heat oil in a saucepan. Add kale, and lightly toast the English muffin while sautéing the kale leaves. After toasting, spread a generous amount of hummus on each half of the English muffin. Add sautéed kale leaves and top with Mozzarella Cheese shreds. Microwave until cheese is melted, about 1 minute, 20 seconds. (I usually microwave them for thirty seconds at a time, checking after each interval). And there you have it–a filling, healthy, and satisfying lunch in 15 minutes or less. 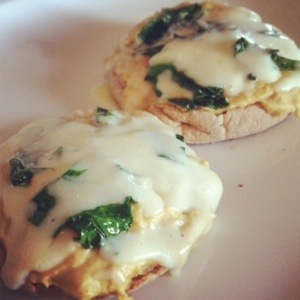 *If you want to give this recipe a little more Italian flavor (and emphasize the “English muffin pizza” connection), you can sub Sun-Dried Tomato-flavored hummus and Broccoli Rabe for the Kale.